Apples preschool and kindergarten activities, crafts, science, games, and printables. Apples are good for you! They are tasty, nutritious, and keep you healthy. 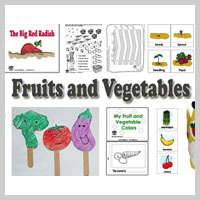 Use our fun apple activities, lessons, and printables to reinforce healthy eating. Learn about Johnny Appleseed and his love of apples. The apple is one of the most popular fruits. Did you know that there are hundreds of varieties? Do you know the seasons of an apple tree? Apples can be used to make several different foods. Discover how different apples can taste if they are baked, simmered, or eaten raw. 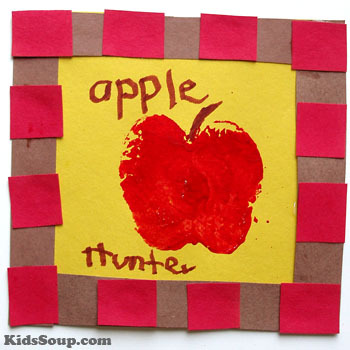 Make apple crafts and learn with our hands-on apple-related activities and printables. 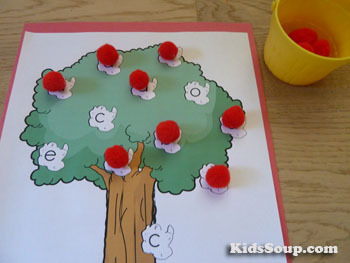 Make several cotton ball apples or paper apples. Create two large trees with brown packing paper and green craft paper and attach to a wall. Add a small velcro dot to each apple and on the trees. Attach apples to trees. Provide baskets and let children pick the apples from the trees. 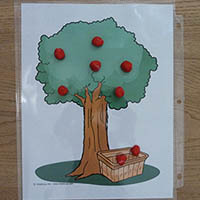 Provide a basket full of red, yellow, and green card stock apples with holes punched along the edges. In a other basket, place lengths of yarn in the same colors with one end re-inforced with tape. 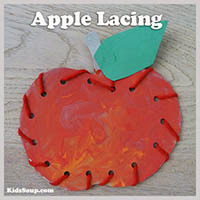 Let children lace the apple cut-outs. 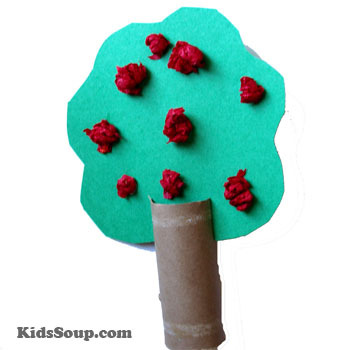 Print a picture of an apple tree and place red pom-poms on the tree. 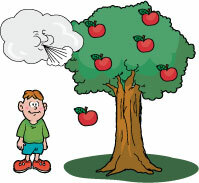 Let children use jumbo tweezers to pick the apples from the tree and place them inside a basket. Trace a tree top shape on to green craft paper and cut out. Provide children with red tissue paper. 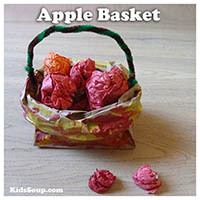 Demonstrate how to roll and crumple the tissue paper to make small red apples. 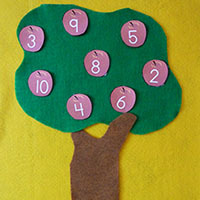 Let children glue the apples on to the tree top cut-out and let dry. Make two cuts on one end of the paper roll and slide tree top inside. 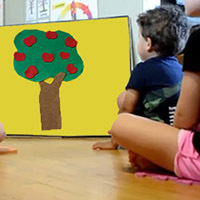 Draw an apple tree on a piece of paper. Place 12 red pom-poms on the tree. 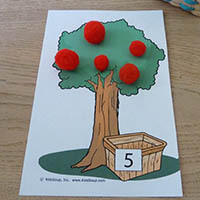 Let children roll a die and pick the matching number of apples off the tree and put them inside a basket. Provide red, yellow, and green pom-poms and three small baskets. 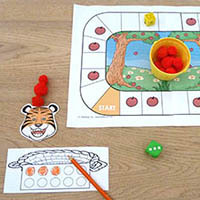 Let children sort the "apples" by colors. 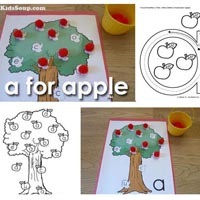 Then encourage children to create a pattern with the apples. 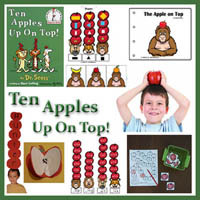 Print out 10 apple trees and write the numbers 1-10 below each tree. Laminate each card. Provide children with some red-apple scented play dough. 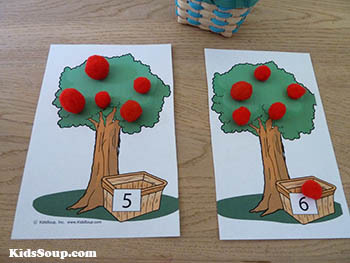 Let children roll the play dough in to small apples and place the matching number of apples on each card. 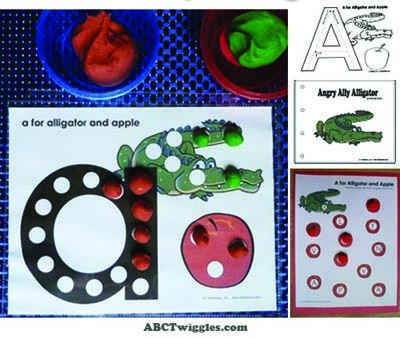 Letter A exploration and Letter A recognition worksheet. Children practice writing the lowercase and uppercase letter A und read a story about Angry Ally Alligator. 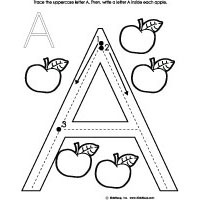 Label apple cut-outs with several letter "A, a" and some with with other lowercase letters. 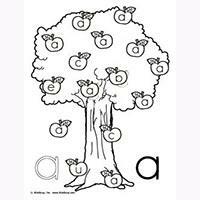 Let children sort and place the apples with the letters "A, a" on an apple tree printable or inside a basket. 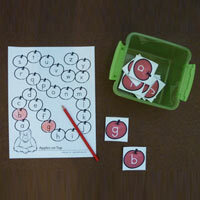 Great letters of the alphabet review activity and game. Ask children what apple color is their favorite. Cut the apples in small pieces and let children taste each apple. Which apple did they like best? 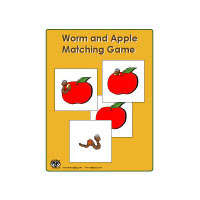 Create a graph and let children choose the matching apple cut-out and place it on the graph. 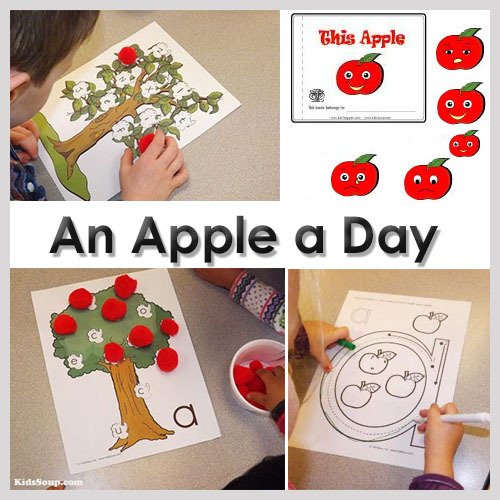 Extension: Let children draw an apple and color it. 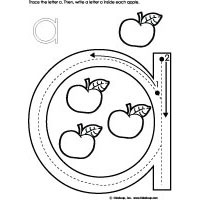 Write I like (color) apples below the drawing and let children dictate or write the matching color name on the page. Place the ABC Apples face down in the middle of the circle. 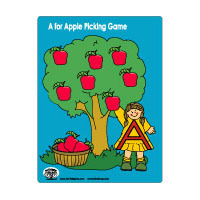 Invite a child to "pick" an apple and name the letter on the apple. Ask children whose name begins the same letter. Let the child place the letter in your reading chart or on the wall. 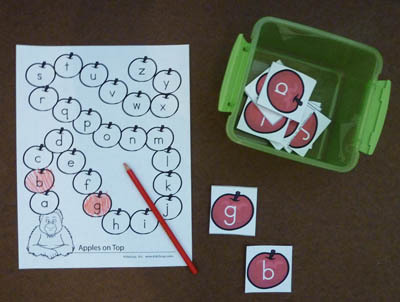 Print the lowercase and uppercase apples and cut out. Let children match the apples. 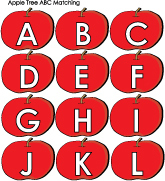 Let children place the apples in the correct ABC order. 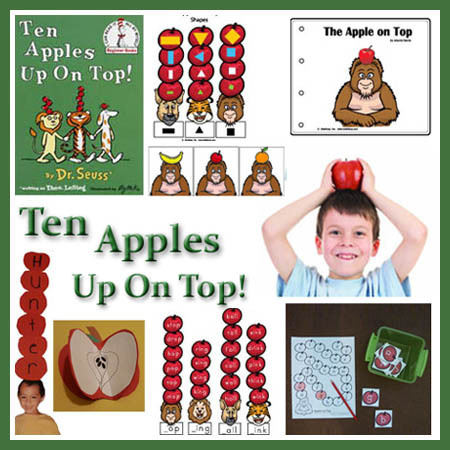 Write the numbers 1-10 or 11-20 on apple cut-outs. Say the rhyme below and choose one child to pick an apple. 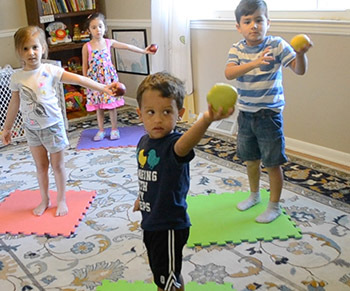 Then, pretend to pick the matching number of apples off the tree by stretching your arm. Tell me what number will it be? Print and glue an apple on cereal box carton and cut out. Punch holes all around the apple. Put tape on one end of a length of yarn. With a knot, tie the yarn on the apple. Have children lace around the apple. Peel, core, and cut apples into chip-sized circles. Dip the circles in fresh lemon juice. Use a wire cutter to cut a white-coated clothes hanger. 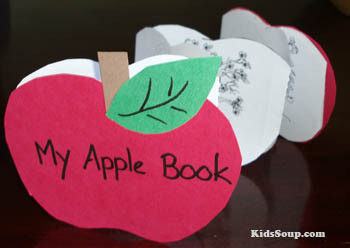 Decorate the hanger with some apples made out of craft paper and add the apple rings. (Don't let the apple slices touch each other.) Hang the apples in a dry, airy spot and let them dry for one to two weeks. Tip: Turn the apples every day. Applesauce is easy to make. Five pounds of apples make about two quarts of applesauce. Peel, core, and slice apples into quarters. Put in a pot and partially cover with water. Boil apples until they are soft. 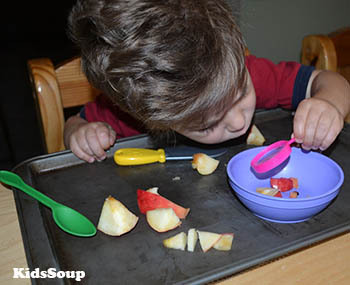 Let children use a potato masher to mash the apples to make applesauce. Add sugar and cinnamon to taste. 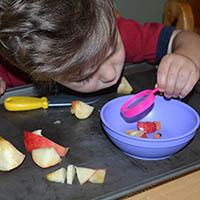 Let children discover the difference between raw, cooked, and baked apples. Cut a couple of apples into slices and bake or simmer. Children will be able to experience the changes in color, texture, and taste. Cut an apple in half. 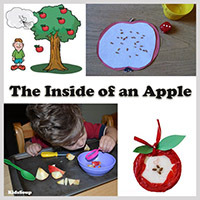 Stick a plastic fork inside the apple and let children make apple prints. 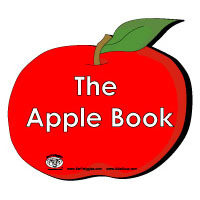 Read the book Johnny Appleseed to children. Make a simple Johnny Appleseed headband. Cut two 2-inch wide strips out of gray craft paper and tape together to make a headband. 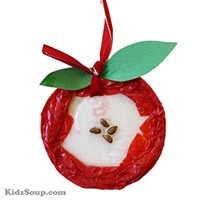 Trace an apple shape on red craft paper and let children cut out the apple and glue to the middle of the headband. Cut a leaf out of green craft paper and glue on the apple. Invite children to write their name on the apple. Fit the headband around the child's head and staple together. 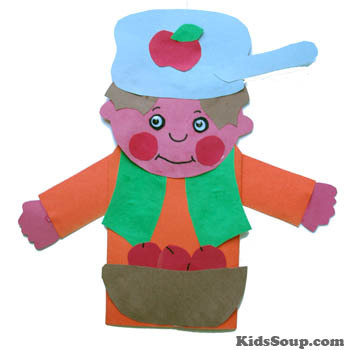 Use the Johnny Appleseed Puppet to re-tell the story. Talk about what plants need to help them grow. 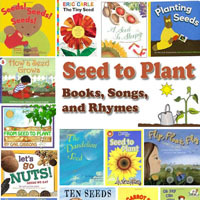 All seeds and plants need sun, water, air, nutrients, and soil in order to grow. 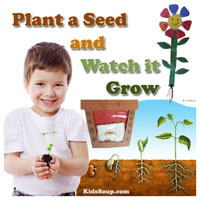 After an apple seed is planted, it takes a few weeks before it will sprout. Then, the roots grow down into the soil. The stems grow upward and toward the light and leaves begin to develop on the stems. 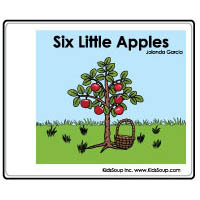 Apple trees do not bear fruit until they are five to eight years old. Then, fragrant white blossoms appear in the spring. The flowers are pollinated by bees and other insects. When the blossoms fall off, small baby apples begin to grow in their place. Only flowers that have been pollinated can grow into apples. By late summer, the apples are fully grown and ripe. The apples are handpicked, washed, and stored. 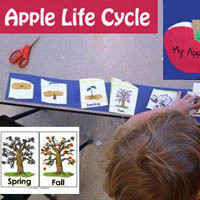 Let children cut out pictures of the apple life cycle and glue them in order. 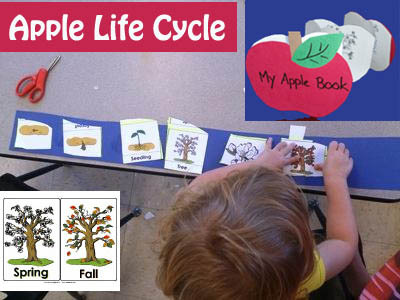 Print out the life cycle of an apple pages and assemble together. 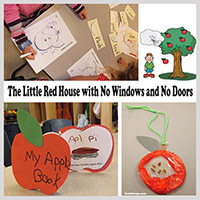 Trace and cut out the two apple shapes from red craft paper and glue to the front and to the back of the apple pages. 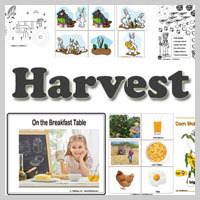 Encourage children to color the pictures and tell you about each page.